Hi, everyone! I'd like to offer you something I created the other day. I'm not sure anyone will find it useful other than me, and maybe it's a little heretical, but... hey. I think it's interesting! Anybody here heard of the Story Circle? 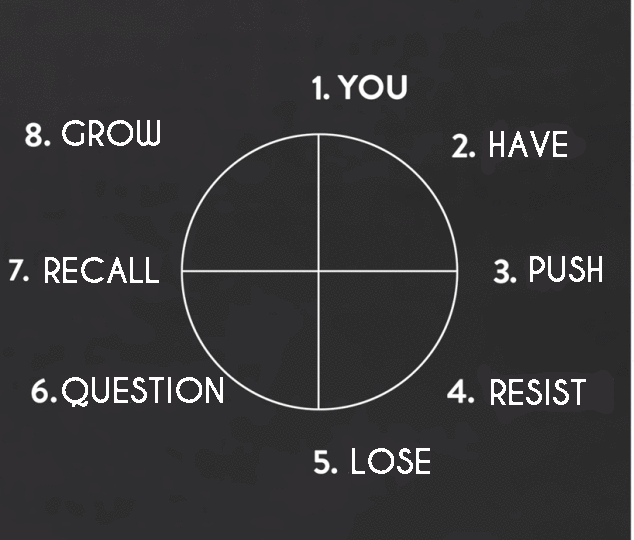 It's a simplified version of the Hero's Journey in the shape of a clock, with eight steps across four segments. 2. Instead of "Need," use Have. For a Steadfast arc, we want to establish the trait that will power them through their story and give them strength. This part of the story will show what the Steadfast Character(s) has/have, as well as show how the world is at the door, eager to tear them down. 3. Instead of "Go," use Push. "Push" to me means two things: 1) the Steadfast Character pushes against the Change character, compelling them to change. (In other words, they Go. I'm coming back to this.) 2) The Steadfast Character gets pushback from the world--the first major challenge to their Steadfast nature. 4. Instead of "Search" or "Adapt," use Resist. In the Story Circle, this is the moment where the Change MC goes on their quest, picks up allies, and starts to grow and adjust to the unfamiliar world. For the Steadfast Character, the exact opposite is happening. The unfamiliar world is trying to creep into them, and they're doing everything they can to hold it back. Whatever Goal they're trying to reach, they have to do it while fighting back against the corruption and temptation they're facing. 5. Instead of "Find," use Lose. For the Change Character, "Find" means a lot of things, but in summary, it's the moment when the MC's realizing the change is working, and that they have the strength to win the day if they fully embrace the change. (They might not fully do it yet, but they're at least a little aware of it now.) By contrast, this is the point where the Steadfast Character has some major setback. The character has hit rock bottom thanks to their beliefs, or even worse, in a moment of weakness they've let their key trait go. 6. Instead of "Take" or "Pay," use Question. This is when the Steadfast Character second-guesses themselves, questions their key trait, questions everything they've ever believed. To me, it's exemplified by the Garden of Gethsemane, where Jesus asks his Father, just for a moment, if he could back out of it, if there were some other way to enact The Plan without his suffering. Or maybe this scene with the Doctor, where he tries so hard to fight what he knows he has to do. 7. Instead of "Return," use Recall. This one's kind of a double pun. On the one hand, it's the opposite of the Push, where it means to recall the Change Character back from the unfamiliar world. On the other hand, it means recall in the memory sense: the Steadfast Character remembers why they believe their key trait, and they re-accept it into themselves after having (nearly) abandoned it. Anyway, I hope you can see what I was trying to do with this. The really cool thing is, these are complementary pairs: if you use this one for the MC, you can use the other one for the Influence Character, and vice versa! But that's enough from me. If you like the Story Circle, maybe this will help you write Steadfast Character arcs. If you don't... then ignore me! Subarashi, @actingpower! Wonderful post. A writer is nothing without his tools. You can never have enough tools, I reckon. So thanks for sharing. I really like #4, where instead of the MC entering the unfamiliar world, the unfamiliar world creeps into the MC. Really cool way of putting it and I think it gets right to the heart of the dilemma for the Steadfast Resolve. How would you see this working for a "Taste of Change" steadfast character (one who fully adopts the alternate point of view early but changes back at the end)? I think at the least, the order might be different...? The only difference between a "taste of change" Steadfast Character and a fully Steadfast Character is that in the Resist/Lose phase, the Taste of Change character insufficiently Resists outside influences and Loses their key trait temporarily. Whereas with a fully Steadfast Character, they Resist effectively, but suffer some major Loss as a result of their beliefs. That's what I have so far, anyway. It's possible there are more types of Steadfast Characters than I've modeled with this Circle, but then again, the Change Circle isn't 100% for all Change Characters, either, so... eh. Yay! The Doctor! He is very much a steadfast character--even when he completely changes personality. I've always gravitated toward steadfast characters. Even before I discovered Dramatica, I understood that the rule that "all characters must change"--as it was once understood--was wrong. I really love Steadfast characters, especially the way everyone else Changes around them. That's awesome! I've been meaning to make that exact thing! Thank you so much!